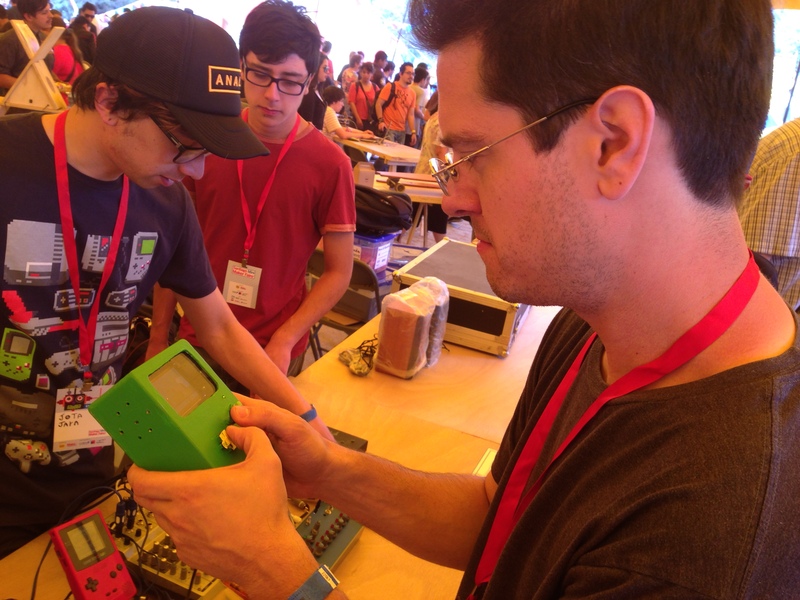 “Qué haces?” I hear a young voice ask as I am setting up a Nintendo Game Boy and a circuit bent Texas Instruments Speak & Math underneath a huge yellow circus tent. My Spanish is not very good, but I know this means “What do you make?” My neighbors to the right are serving beverages from their Raspberry Pi powered drink machine. Eight wooden aboriginal figures dispense tea and juice via their tiny, but proportionally gi-normous wooden phalluses. To my left, people are lining up for a virtual hang-glider ride. Just outside the tent, a T-Rex is stalking a group of children. 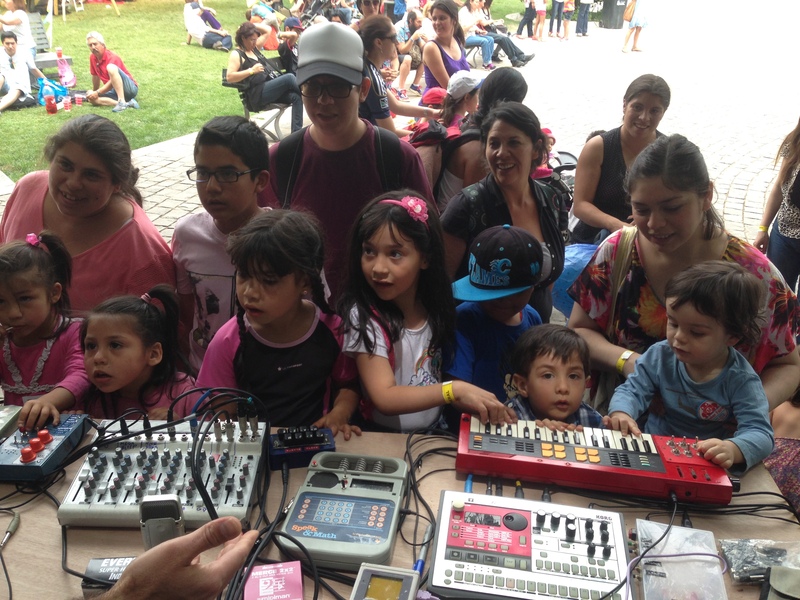 I put my poor Spanish skills to use: “Hacemos música electrónica, y hacemos instrumentos musicales con jugettes antiguos y… otras cosas locas.” I give a quick demo of the devices in front of me, all of them at least a decade older than this young lad. His father joins him, still a little dizzy from the Oculus Rift hang-glider ride. “Ah! Game Boy!” he exclaims with a smile. We hear an adrenalin-powered eruption of terrified screams from the children outside the tent, their hard-wired fight-or-flight systems triggered by the charging Tyrannosaur. Rewind to late September, 2013. The New York Hall of Science in Queens, NY: site of the 1964 World’s Fair. 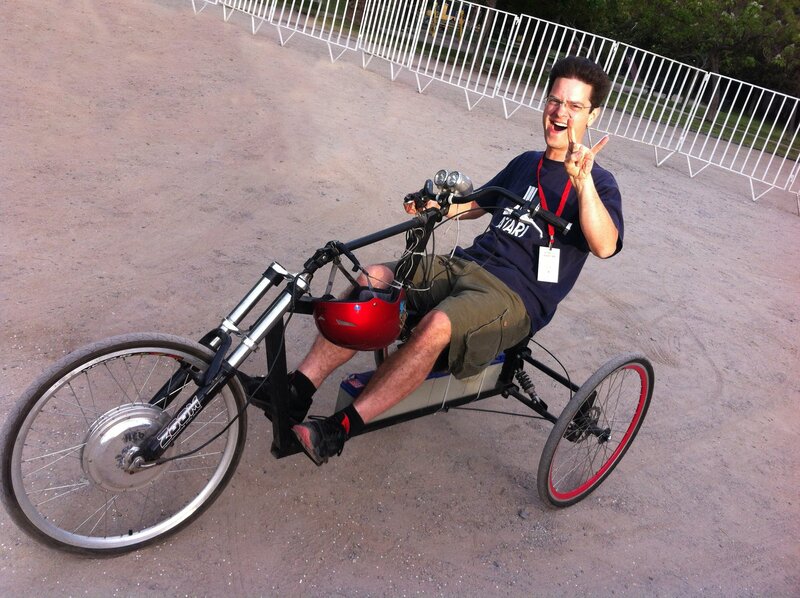 The 2013 World Maker Faire is in high gear. Thom and I are jamming and demonstrating our crazy hand-built music toys before the backdrop of the Mercury-Atlas and Gemini-Titan rockets, monuments of the great space race that continued to echo throughout our childhoods. Thom’s photo-sensitive TV synth is drawing many curious looks. Its complex waveforms manifesting as bright, fast-moving squiggles on an ancient cathode ray tube. We have a crowd of 20 or 30 people surrounding us. Half of them are children. One of the children can no longer contain his curiosity. He reaches out for the bright blue arcade button on the TV synth. “No, don’t touch!” his mother admonishes. “Yes, please DO!” I say, “That’s the whole point.” Thom shows him how to play the thing by waving his hand over the light sensor. 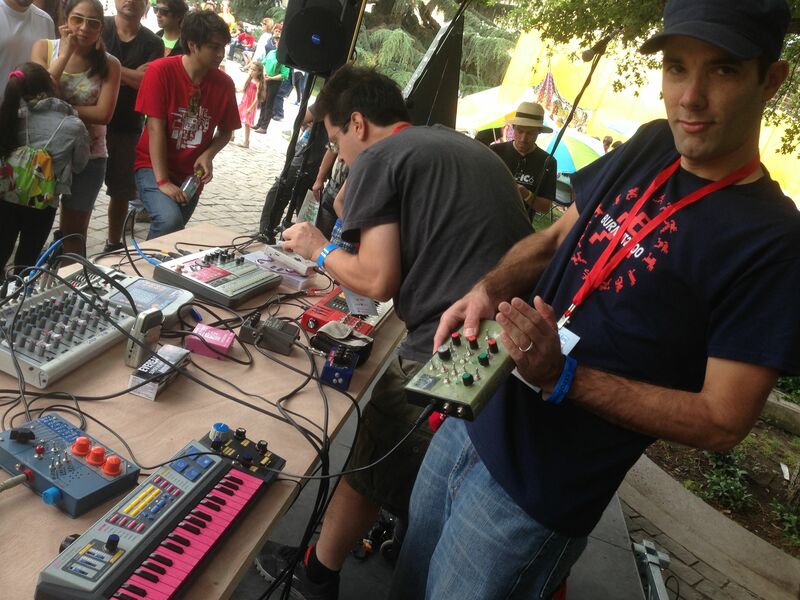 I show the kids how to sample their voices into my circuit bent Casio SK-5 keyboard. “Hello!” “Pizza!” Before long, the children have taken over. They are pressing buttons, turning knobs, throwing switches with reckless abandon. I can no longer contain myself and I double over with laughter, cackling like a madman. This is insane! A man in the crowd who looks like he could be Robert Downey Jr.’s brother is filming this madness on his phone. We exchange smiles and then he walks off to take in more of the Fair. 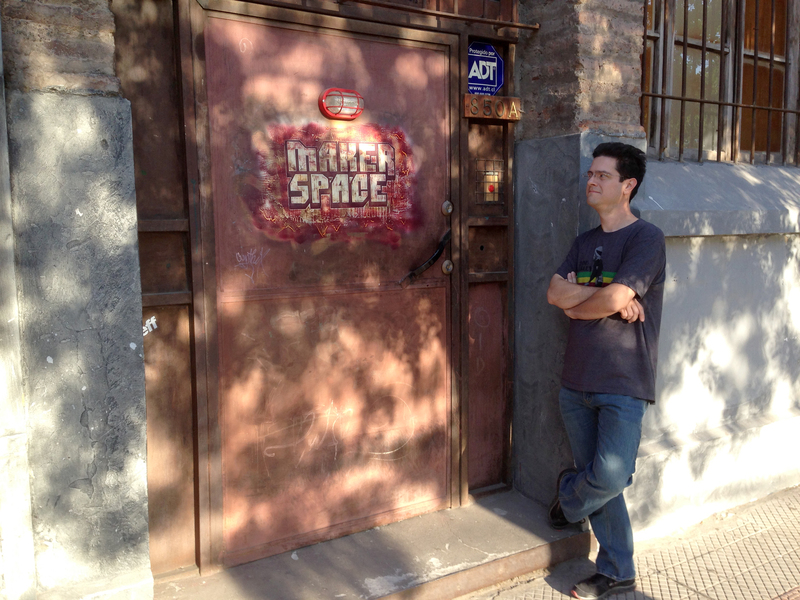 In a few days, we would learn that this man is Tiburcio De La Carcova, entrepreneur, video game tycoon, and founder of the Santiago Maker Space in Chile. Later we would learn that he resembles Iron Man in every way except for the huge ego. He never took our business card or introduced himself. 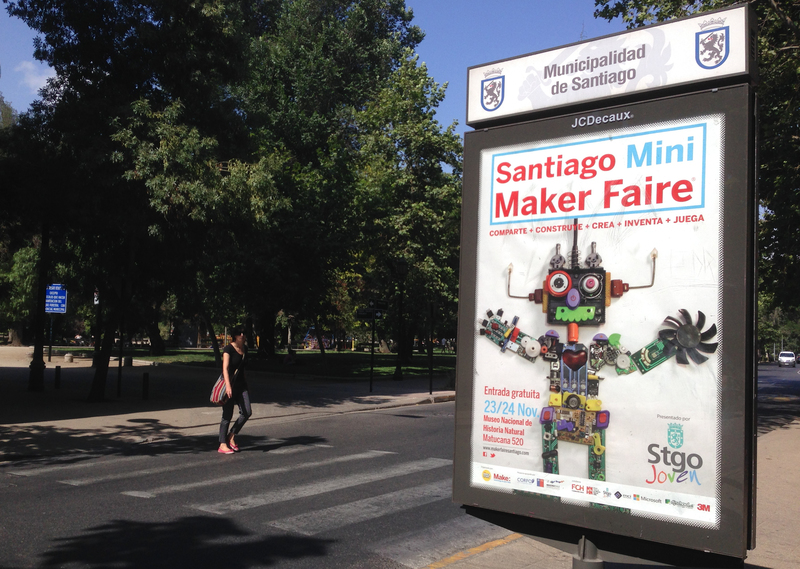 Instead, he reviewed his video, googled the logos on our band t-shirts, found our website, and emailed us with an offer we could not refuse: Come to warm, sunny Santiago for a week, check out the Maker Space and take part in South America’s only Mini Maker Faire. 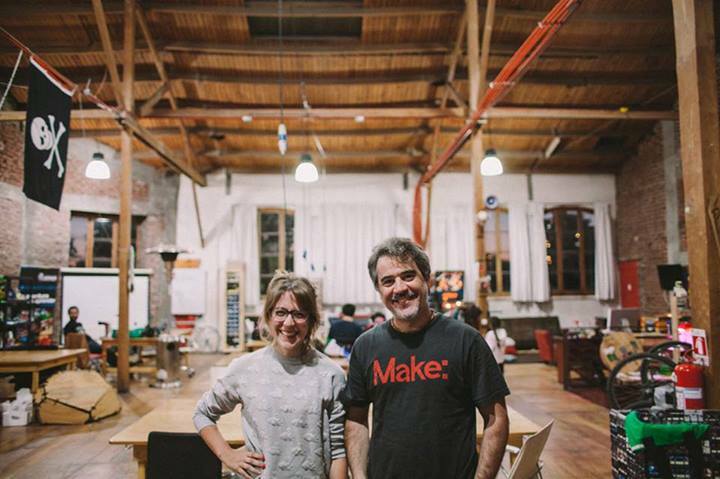 Tiburcio founded the Santiago Maker Space along with 29-year-old industrial product designer Macarena Pola in February of 2012. It is a large warehouse space, a former hat factory in the heart of the city with two-story vaulted ceilings and huge windows in every wall that allow for plenty of natural lighting. Since then, it has blossomed into a large community with a core group of about 10 staff members, 25–40 paying members, and 70–100 volunteers who have received scholarships, most of them local young robotics students who helped renovate the space. The day after the Faire, I had a chance to sit down with the two founders and chat about the origins of the Maker scene in Santiago. Ads for the Faire could be spotted throughout the city. “The fact that we had this Mini Faire prototype with 70 makers, it gave us the confidence that we can actually grow bigger,” Tiburcio says. “It taught us a lot: What were the things that went wrong? What were the things that went right?” He goes on to say that even though they may have had some trouble with the tents, like the intense heat from the mid-summer sun, it was the content inside the tents, provided by the makers, that made South America’s inaugural Mini Maker Faire special. Fast-forward back to this year’s Faire. You can tell they have learned a lot. 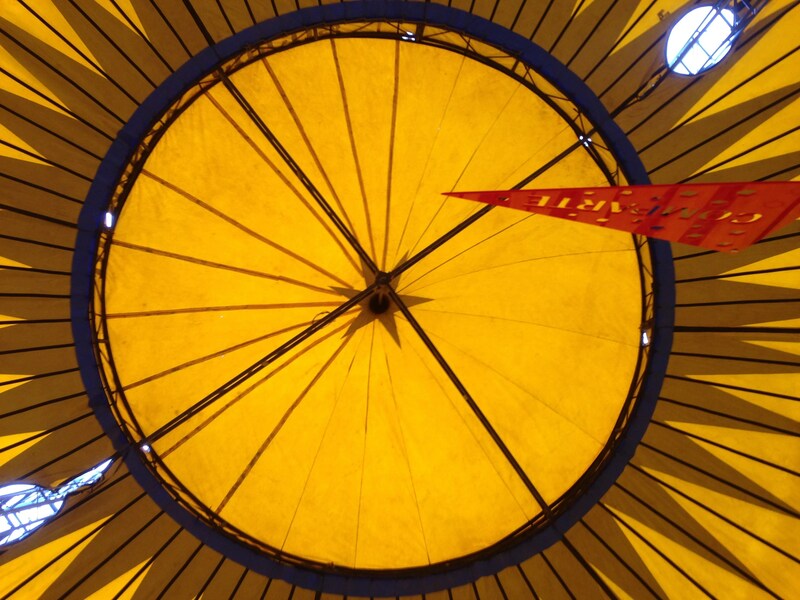 The tents are air-conditioned. There are over 100 makers, including over a dozen that have been flown in from other countries. The kids take over (again). After the Faire ends, everyone heads back to the Maker Space for a champagne celebration. Everyone is in high spirits because the weeks of preparation have paid off. This weekend’s Mini (or should I say … Mega?) 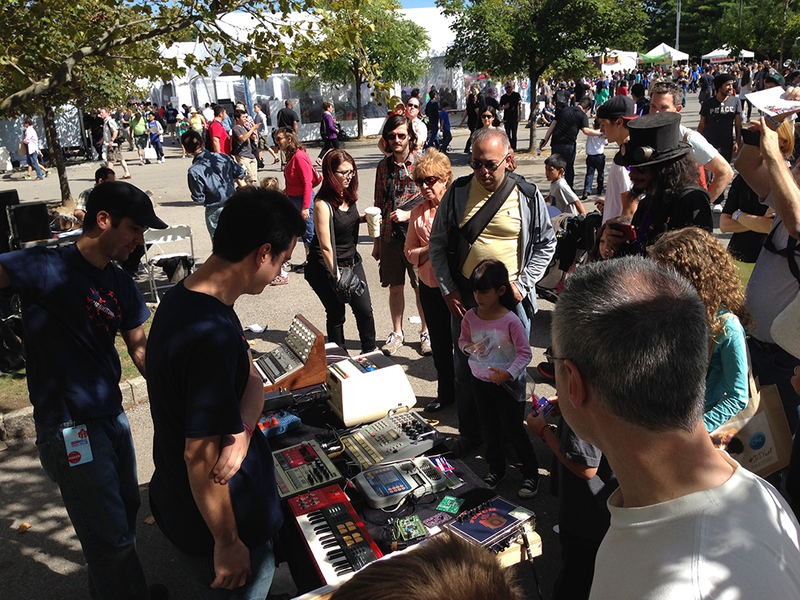 Maker Faire was a smashing success. I’m geeking out on some random nerdy topic with Joaquín Aldunate and Pablo Guerra Volbonte, two of the Maker Space members who were a tremendous asset to us in the past week, as someone plugs their laptop into the stereo system and cues up 80s and 90s dance music on YouTube. A cheer fills the air as the music is cranked up. One of the girls grabs Joaquín and brings him to the dance floor. I guess the nerd talk will have to wait. “Bailamos?” I ask Pablo. “Sí!” he responds with a grin, “Con las chicas!” Rest assured, dear reader, we all danced until we could dance no more.